Vegetarians And Meat-eaters Share a Thanksgiving Meal : 13.7: Cosmos And Culture Do vegetarians and vegans think they are better than everyone else? Do omnivores wrongly think they are being judged by their meatless friends and relatives? Commentator Tania Lombrozo says that, while some on both sides are just self-righteous and annoying, many people are ready to put aside their misconceptions and sit down at the table to feast as equals. For a holiday that's putatively about breaking bread to break cultural barriers — Native Americans and pilgrims happily sitting down to a pumpkin pie, or was it a lowfat pumpkin cheesecake? 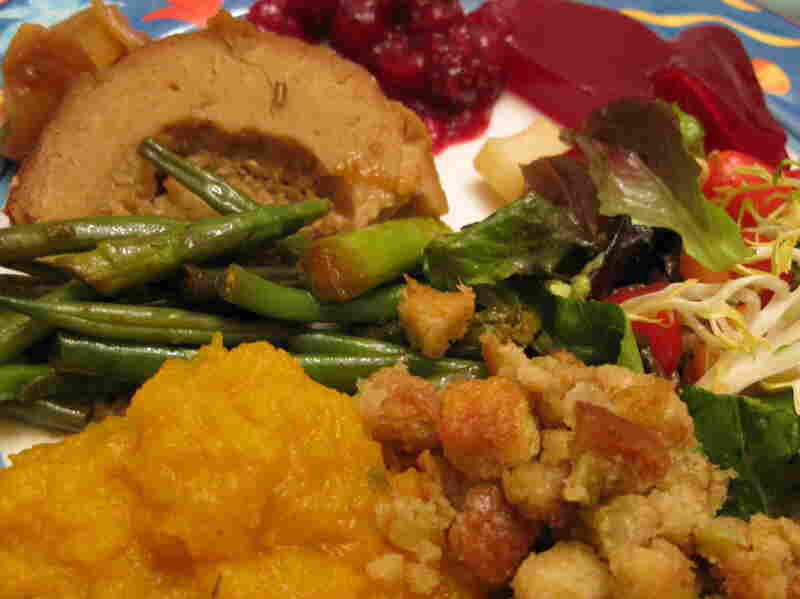 — Thanksgiving can also be the source of serious food-borne tension. Who eats what isn't just a personal preference anymore, it can be a health choice, a moral commitment, an environmental statement and a marker of one's identity. So it's no surprise that last Thursday, as we coordinated oven times for turkeys and Tofurkys, I found myself thinking back to one of Barbara King's posts on vegetarianism, a post in which she asked: Do vegetarians and vegans think they are better than everyone else? Vegetarianism is a blossoming field of study, with research in psychology and other disciplines exploring the characteristics of vegetarians and omnivores, as well as people's perceptions of vegetarians and omnivores. So there are a few morsels of recent data that speak to Barbara's question, and the answer is: sort of. In one study, vegetarians did rate a fictional person who most often ate "tofu, vegetable tempura, salad, whole-wheat bread and lentils" as more virtuous (i.e., more tolerant of others, kind-hearted, considerate, concerned and virtuous) than a fictional person who most often ate "lamb, lean beef, salad, whole-wheat bread and chicken burgers." But omnivores also judged the tofu-eater more virtuous than the lamb-eater, if to a lesser degree — a difference of .5 points for omnivores versus 1.3 points for vegetarians on an 8-point scale. The fact that vegetarians showed a greater "vegetarian-advantage" should come as no great surprise: many vegetarians transition away from omnivory precisely because they find meat-consumption morally problematic. The bigger surprise is that omnivores judged vegetarians more virtuous despite the mismatch between vegetarianism and their own dietary choices. But if that's the whole story, it's hard to explain the cultural resonance of something like the clever New Yorker cartoon that has one woman explain to her dinner companion, "I started my vegetarianism for health reasons, then it became a moral choice, and now it's just to annoy people." Why the perception that vegetarians are judgmental and annoying? Those individuals who publicly tout eating no meat, especially when their stated reason has to do with caring about animals, are thought to be telegraphing a message of superiority: My dietary choices make me a better person than you. Vegetarians aren't just perceived as thinking that their food choices are better, but as actively judging and condemning their omnivorous peers. This prompts a phenomenon known as "do-gooder derogation": to deal with the threat of anticipated reproach, people will trivialize or otherwise derogate do-gooders and their behavior. In a study of this phenomenon, omnivores again judged vegetarians more moral than their omnivorous peers, but expected that vegetarians would perceive this gap as nearly 10 times as big — that is, that vegetarians would rate the difference in morality between meat-eaters and vegetarians as nearly 10 times greater than the omnivorous participants believed it actually to be. A follow-up study confirmed that omnivores inaccurately overestimated how harshly vegetarians truly judged them. But it seems to be precisely this perceived threat of moral reproach that triggers derogation: the omnivorous participants who believed vegetarians would judge them most harshly were also most likely to associate vegetarians with negative words, such as "uptight," "preachy," "self-righteous," "crazy" or "weird." So do vegetarians and vegans think they're more moral than everyone else? Or better people in general? And does this belief translate into the self-righteous and annoying behavior that might justify the t-shirt slogan, "nobody likes a vegetarian"? Well, the research only really addresses the first question. But here's my take. People who are vegetarian or vegan for moral reasons do think their dietary choice is morally superior to that of omnivores. That's why they're vegetarian or vegan. But this only translates into annoying self-righteousness in a small (but vocal) minority of this dietary minority, and people belonging to that minority might have been annoying and self-righteous even if they weren't vegetarian or vegan. Some people are just self-righteous and annoying. Unfortunately, the psychological research suggests a vicious cycle. If omnivores overestimate the extent to which vegetarians are judging them or their diets, they might respond with some form of derogation. If vegetarians feel they are being unfairly characterized or belittled, they might respond with actions or arguments that can seem self-righteous and annoying. And so it continues. Can't we all just get along, like the Native Americans and the pilgrims? OK, bad example; but there are some valuable lessons here for turkey- and Tofurky-eaters alike. For the turkey-eaters: vegetarians probably aren't judging you as harshly as you think they are. For the Tofurky-eaters: making meat-eaters feel judged is no way to win converts. And for the turkeys: better luck next year; I'm on your side.